Experience the exotic flavors of Ethiopia. Open Monday - Saturday, 4:00pm - 9:00pm. Located in the Miraloma Park Shopping Center. Experience the sights, sounds, smells and taste of Ethiopia. Zagol is the first and only Ethiopian restaurant in the Reno / Tahoe region. 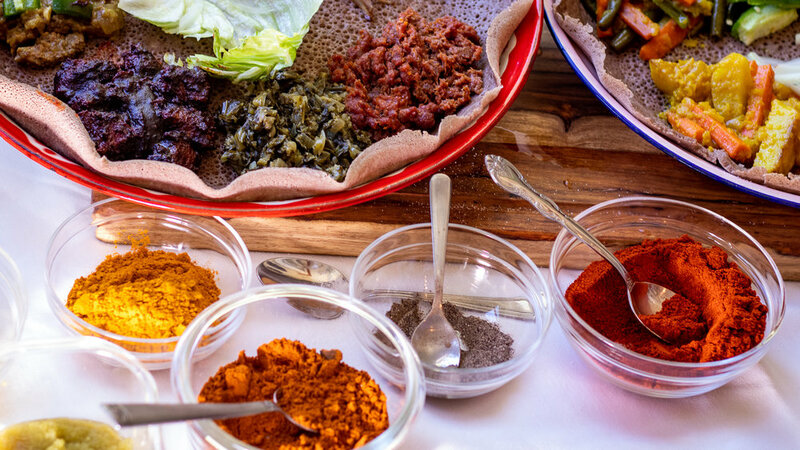 Mixing both modern and traditional Ethiopian cooking techniques, the chef of Zagol expertly blends exotic spices to create tantalizing, authentic beef, chicken, lamb and vegetarian dishes. Visitors to Zagol will enjoy a fascinating, relaxing atmosphere featuring authentic Ethiopian décor. Staff will happily instruct patrons in the art of eating in the traditional Ethiopian fashion of using just Injera, a traditional Ethiopian flatbread made from wholesome teff flour. It is widely known that Ethiopia is the birthplace of coffee and Zagol brings the time-honored tradition of the Ethiopian whole bean coffee ceremony to Reno for the first time.